For road drop bars with V brakes. 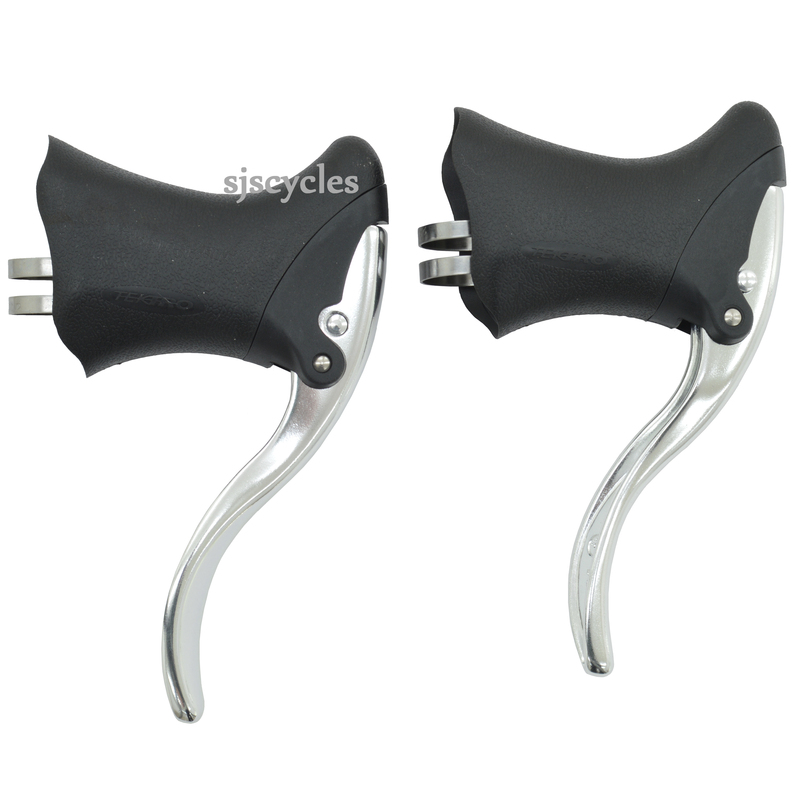 Forged alloy and road racing lever, -compatiable with linear pull brakes (MTB V brakes), designed for adult bikes with quick release and return spring, - for handlebar diameter of 22.2mm or 23.8mm. Put these levers on the 2002 Thorn Adventure 531 tandem we bought last spring, allowing a V brake rear in place of tricky Suntour SE and removal of a travel agent fitted at the front by the first owner. I used noodles with adjusters in both cases. Braking is now very powerful both ends and the simplicity of the brake lever and bar end gear lever arrangement is attractive for a coupled bike were the cables go slack when the bike is split. The cable quick release is handy since it allows for quick wheel removal (changing a flat tube, regular maintenance). Flared/curved levers makes for a nice feel to when braking from the hoods. The rubberish hood grips/covers seem to be of good quality. Overall the construction is simple, rigid and I'm not surprised if these will last for a long time. By far the cheapest option, but with no snags, so why pay more? They give strong braking with plenty of feel. I find the hoods comfortable. They were easy to fit, look good and are well made. If you're fitting drop bars to a flat barred bike, don't forget you'll need longer cables and in line adjusters too. From other sites, it appears that this lever is virtually identical to the similar Cane Creek lever, but at a lower cost. It works perfectly with the v-brakes on my bike (Avid) and has some useful features - a button to release the tension on the brakes for easy wheel removal, and "flared" levers which make for a more comfortable feeling when braking from the hoods. I am very impressed. V-Brakes and MTB cable disc brakes use the same cable pull so these levers should be fine for use with your Avid BB7 MTB disc brakes. Replacement Hoods For This Item? I've a pair of these levers on which the hoods have been attacked by rodents whilst the shed over winter. Which of the wide range of rubbers you stock would you say is best fit to replace these, or did i miss Tektro items in my search ? Unfortunately there are not any replacement hoods available from Tektro's UK supplier for these levers so we are not able to order any. I am not aware of any compatible alternatives that we have in stock either I'm afraid.